Orthodontics Dentist Sioux City IA | Straightening teeth with traditional orthodontics & clear dental aligners! Dr. Salmons has been furnishing children and adults with attractive, straight smiles by means of traditional orthodontics for over 25 years. With conventional braces, continual, gentle force in the direction of a desired adjustment modifies the position of teeth over time. Here’s how it happens: a set of brackets is attached to a tooth. These brackets act as handles to which other components are connected to move your tooth in specific directions. A narrow metal wire called an archwire connects to each bracket. Using tension, the archwire exerts tautness on your teeth to shift them into place. Colorful (or clear) elastic bands are stretched to secure the archwires to the brackets. As modifications are required, archwires of assorted diameters are tensioned and ligature elastics are replaced. 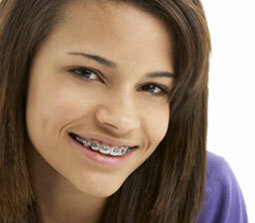 Traditional braces permit Dr. Salmons to have more control over how your teeth are brought into alignment. More intricate improvements can be done using this technique. Because this style of braces can’t be easily detached and are continually monitored, there is less chance of difficulties caused by failure to follow the treatment plan accurately. Our patients are thrilled with their beautiful results. Dr. Salmons is pleased to offer Invisalign™ invisible aligners, a state-of-the-art solution that permits you to achieve straight teeth in as little as 9 - 15 months! These aligners can correct overcrowding, widely spaced teeth, overbite, underbite, or crossbite. Invisalign uses sophisticated 3-D computer-imaging technology to formulate your complete treatment plan from the present position of your teeth to your final, amazing smile. Clear thermoplastic aligners comparable to teeth-whitening trays are tailored to precisely fit your teeth. 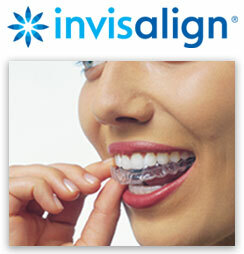 Each set of aligners is worn for about two weeks. You only need to appear in the office for assessment every four to eight weeks. Total treatment time is determined by your personal needs and goals. A straighter smile is just a phone call away! Call for a no-cost/no-obligation consultation at (712) 239-5900 to determine the best option for you.